Grundy Art Gallery is delighted to announce a multi-sensory exhibition by Kai-Oi Jay Yung, Amongst Dark Trees, A Clearing. Through film, the drawings series Auto-Psychometric Suffering Devices (A-PS Devices), a sound responsive light installation Passings, and hand-sewn craft works Mottos In Thread, this exhibition explores uncanny narratives in suffering and loss in relation to our psychological and physiological blockages. In four video works, we encounter voices of conflict and resolution. From an excessive compulsive hoarder and trauma psychologists in A Plan For Nigel, to a satirical stand up comedian in You Don’t Actually Die. David T. Hyde’s sharp observations are pitted against inner antagonisms in relation to humour and self identity. The meditation savant in Breathe offers a chance for contemplative guided meditation, whilst Events of the Day uses disco lighting to create a mesmerising interpretation of psychotherapy hypnosis. Yung inventively crosses technology with handcraft and interprets various belief systems- from science’s chromatic healing treatments to notions of the unseen and the body’s mystical energy chakras. The artist transforms Grundy into a stimulatory site that triggers sensory interactions with the viewer. They journey through each gallery space’s transitional environments, re-assembling perspectives on alienation and anxiety towards hope and possible inner clearing. In response to Yung’s call out, the Mottos In Thread are intricate hand-sewn mottos sent in by people of all ages and locations, a collection of fragile, personal self-taught wisdoms sharing commonalities made from pieces of first wedding dresses to sharing intergenerational aphorisms. A 68 year old St Anne’s resident hand stitches ‘Worse Things Happen At Sea’ recollecting ‘boats from the West Indies brought bananas to Preston across the mighty ocean… a beautiful grey horse called Titus chucked its rider and ran off…only to drown as the tide rushed up under the sand.” Yung offers a chance to revisit lost skills and stories whilst paying homage to similar testimonial acts produced by Holocaust victims as an outlet for the atrocities experienced. In the ‘clearing’ of the main gallery space, we hear 7 Circles played intermittently; a collective sound piece composed from public recordings sent to Yung of the monosyllabic sanscrit sounds- ohm, yam, ram, lam… each linked to seven bodily chakras and believed to purify body and mind. The public is invited to add their own harmonies and interplay with this sound piece to create a live harmonic mantra that pervades the gallery. From a semi-concealed confession booth, the viewer intimately shares their inner thoughts and emotions, activating a microphone that transforms and amplifies their sounds. Unexpectedly, they trigger a visual display of neon-coloured light rays and patterns unexpectedly immersing fellow viewers in ambient warm light tones. This interactive sound-light installation, Passings, together with the ever-changing soundscape of 7 Circles allow sounds and visuals to resonate through the gallery and offers a space of sensory absorption and playful solace. Amongst Dark Trees, A Clearing progresses the artist’s ongoing investigations into examining blockages within the individual and collective psychological and physiological experience of identity developed in previous performances as Military Craft, China and installation Interval; A Narrative Psychosis. Clinical psychologists featuring in the show and panel discussions include Helen Caird. “No human state is static- one isn’t ‘depressed’ or ‘traumatised’ more accurate we ‘deal with trauma”. Laura Kemmis says “Jay’s multi-sensory and interactive work awakens the viewer’s senses- to take notice of their experiences. Her concepts draw parallels with mindfulness, an increasingly widespread psychological practice”. 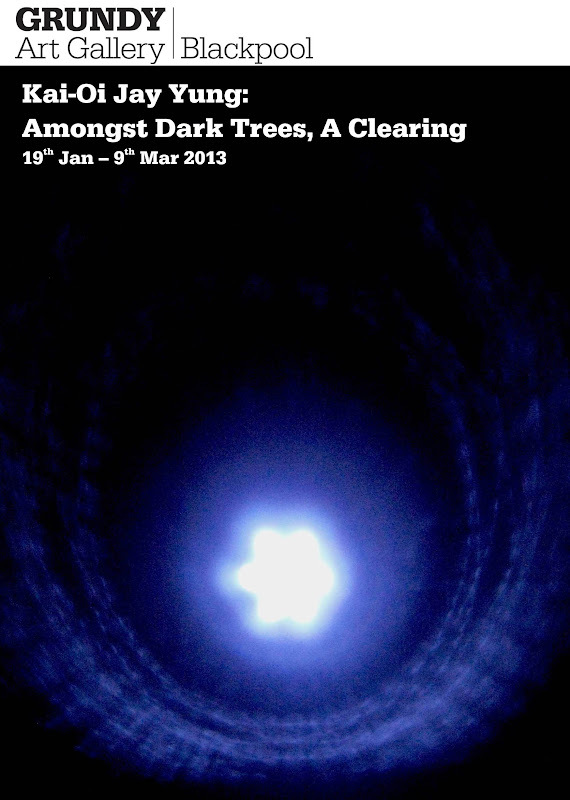 Amongst Dark Trees, A Clearing is supported using public funding by Arts Council England.